A fresh coat of snow, drizzled in hues of blue from the early morning light, blanketed the field at the foot of Mt. Moosilauke. The snow was broken only by a classical cross country ski track showing the way. To the west, through the towering trees, the hills were awash in sunlight, fulfilling the promise of a rare cloudless day. The ascent of Mt. Moosilauke via the Glencliff Trail (also the Appalachian Trail) was just beginning, and already it was hard not to love this idyllic winter hike. In the summer, Mt. Moosilauke welcomes northbound AT hikers to New Hampshire’s White Mountains, and the gradual ascent via the Glencliff Trail is a gracious host. No doubt, many NoBos have ascended the Glencliff Trail as if it were a mere speed bump, and, basking in the sun on Moosilauke’s windswept summit, dismissed the stories of roots and rock scrambles as no match for their nearly 2,000-mile-trail-tested legs. A notion the Beaver Brook Trail descent quickly dismisses as fools gold. Snowdrifts! It’s like hiring Mother Nature as a personal trainer. It doesn’t matter how many times you scream uncle, she has no mercy. Add snow and the Glencliff Trail balances scenic charm with enough challenging terrain to keep the blood pumping. Not to mention Moosilauke’s open, rock-speckled summit can be both spectacular and sinister depending on the fickle whims of Mother Nature. Having had my eye on this hike for quite some time, I’m guilty of cherry picking a day when the views would be aplenty. The hike begins on an old farming road that skirts around a couple of fields and crosses a small brook before entering the woods at the junction of the Glencliff and Hurricane trails. The first two miles gradually ascend the mountain with a fair amount of horizontal hiking. Even in February, the day after winter storm Nemo, there wasn’t a lot of snow in the lower elevations and it wasn’t uncommon for my snowshoes to grind across a rock. The trail itself isn’t any worse off from the storm as there’s currently only one blowdown that presents any sort of obstacle. Eventually the Glencliff Trail kisses the roundabout approach goodbye and turns straight up the slope. Here’s where the fun really begins, the roar of the wind above foreshadowing the summit’s temperament. The trees are spread thinner at this point, enabling the wind to cover the trail with hearty drifts. My punishment for being the first to arrive this morning was trail-breaking duties, a job I was happy to do but also willing to relinquish for a bit when a couple of hikers caught up. A quick viewpoint on the upper section of the Glencliff Trail. The Glencliff Trail ends at a junction with the Carriage Road in a sag between the South Peak and the main summit. Mere feet before the junction is a .02-mile side trail leading to the South Peak, which is worth the jaunt on a clear day. Turn left onto the Carriage Road, also following the Appalachian Trail, to reach the main summit. The Carriage Road corridor is a gradual climb lined with conifers and stuffed with snowdrifts. Glimpses of the rewarding views soon to come are teased through the trees. 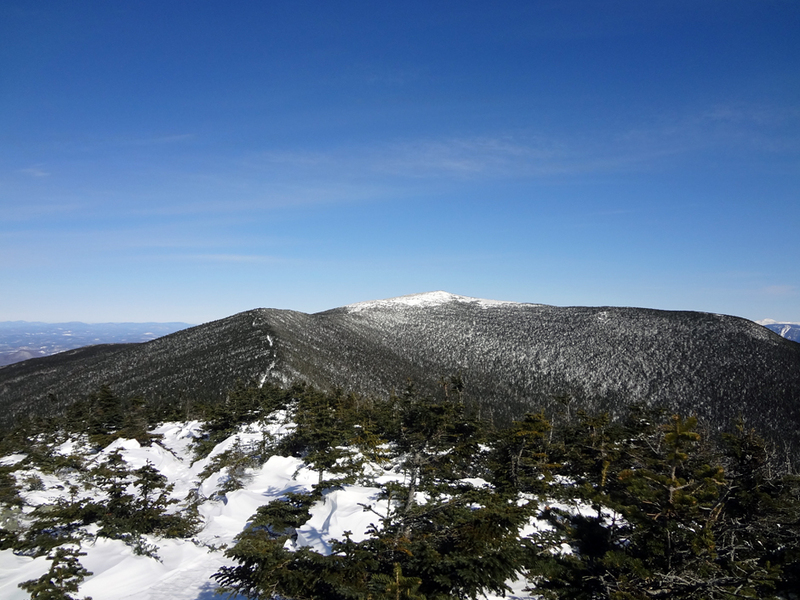 It isn’t long before the Carriage Road reaches treeline and follows cairns up the rocky cone of Moosilauke’s summit. Most snow has been blown off the top or aggregated into sculture-like formations, leaving an icy path. If the conditions aren’t too harsh, it’s probably a good idea to trade the snowshoes for traction at treeline, bundle up for the summit, and leave the pack for retrieval on the way back (none of which I had the foresight to do). You will want to have full face and eye coverage on most days, and when the summit is enshrouded in clouds hikers should strongly consider turning back here—three trails converge on the summit and it would be easy to get mixed up in low visibility. Fortunately there were no clouds on this day, treating those of us who drew the lucky straw with views from Vermont’s Green Mountains to Mt. Washington. Pelted by wind the summit stay was short lived but more than worth every ounce of effort to get there. From the south, take I-93 to exit 26 in Plymouth and follow Route 25 to Glencliff Village. Turn right onto High Street (the street sign is currently missing, but it’s on a corner just prior to a church) and follow it 1.2 miles to the trailhead parking lot on the right. The Carriage Road shortly after the intersection with the Glencliff Trail. The Mt. Moosilauke summit as viewed from a break in the trees on the Carriage Road. The Moosilauke Summit is windswept and bare in the winter. Looking north over Mt. Lafayette, Mt. Lincoln and the Franconia Ridge, as well as Mt. Washington and the Presidential Range in the background. Glancing south over the Appalachian Trail ascent and the South Peak. The 360 degree views continued looking east. Remnants of the stone lodge that once stood on the Moosilauke summit. The cairn atop the South Peak. One last view of the main summit, this one from atop the South Peak.